Molecular markers allow inference on past historical events and recent patterns of gene flow. 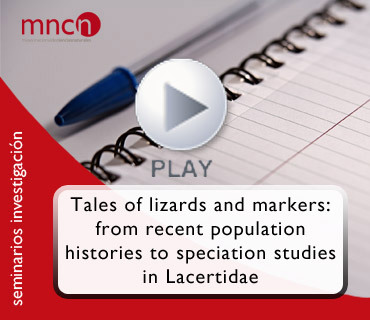 We have applied these approaches on a series of biological questions and models including several Lacertid species. These include conservation genetics of the Bonnal’s Rock Lizard Iberolacerta bonnali; where we have used mitochondrial DNA to identify ESU and a combination of mtDNA and microsatellites to elucidate the geographical distribution of genetic diversity and test scenarios of post-glacial range expansion with the use of ABC modelling. We also work on speciation in the Podarcis hispanicus complex, focusing on 1) comparative approaches of reproductive isolation and the genomic consequences of hybridization. I will present results and projects corresponding to these two fields of investigation, and will conclude with ideas on the role of olfaction in speciation, a question where Podarcis seem to be a promising model. Presentación: Jesús Ortega. Dept. Biodiversidad y Biología Evolutiva, Museo Nacional de Ciencias Naturales, CSIC. Ponente: Pierre-André Crochet del Centro de Ecologia Funcional y Evolutiva, Montpellier, Francia.